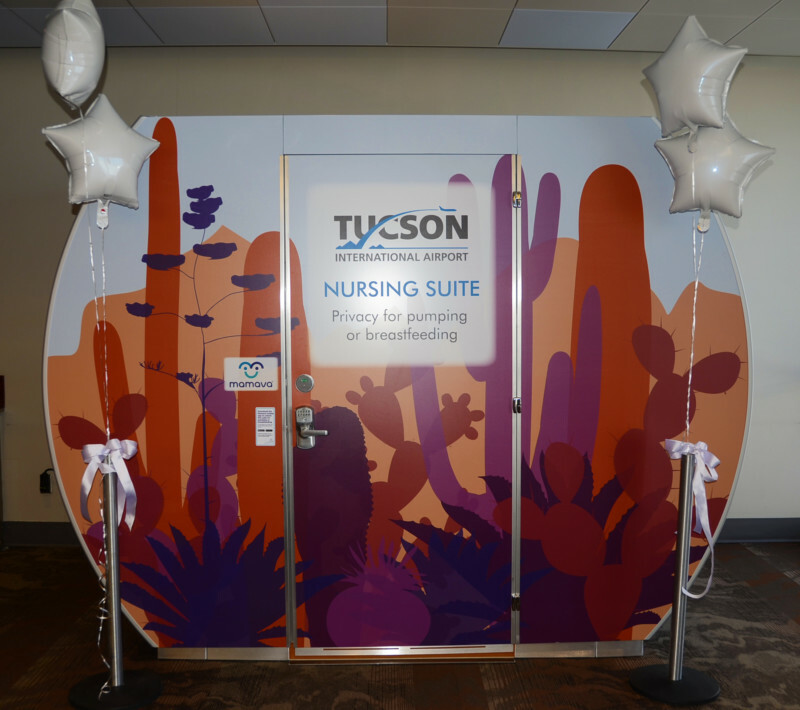 Nursing mothers traveling through Tucson International Airport now have access to Mamava lactation suites providing privacy while breastfeeding or pumping. The suites, part of the Mamava network, debuted Wednesday on each of the concourses of the airport terminal. Each pod has a locking door, electricity, a fold-down table and bench seating. The suites should be immediately recognizable by the desert cactus design on the outside. Mothers departing on Southwest, Sun Country, United or Via Air will find the breastfeeding pod on the A Concourse near gate A3. On the B Concourse passengers departing on Alaska, American and Delta airlines will find the pod at the midway point of the concourse across from the restrooms. The pods, created by Vermont-based Mamava are 4-feet by 8-feet and meant for individual use but can accommodate mothers with their baby and other children. To celebrate the installation of the Mamava pods, the TAA held a ribbon-cutting ceremony with special attendees from Tucson Medical Center, Vice President of Community Benefit Julia Strange and lactation specialist Asa Lader, as well as local breastfeeding support group Mama’s Latte.